In March of 1837, a New Englander named Horace White arrived in what is now Rock County, Wisconsin, and decided to stay. And, it’s clear, he didn’t leave a will when he died. You won’t find that fact in the collection of probate records online at Ancestry.com. There’s no record of Horace White’s estate there. And you won’t find it in the probate collection at FamilySearch.org either — the Rock County records haven’t been digitized. But you can find out who the children were, who their mother was and who she married after their father’s death, who served as their guardian and what likely happened to the land Horace White left in Section 26 by looking at a different source altogether. The laws of the State of Wisconsin. This is what’s called a private law — a law passed for the benefit of one or more individuals rather than a law generally applicable to everybody. And private laws are terrific genealogical resources. The Legal Genealogist has written about private laws before7 and this week you can find out more about them. 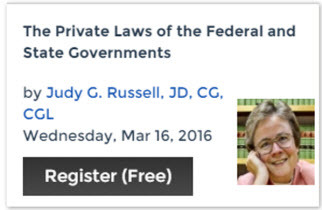 Because, this Wednesday, March 16, I’m doing a webinar as part of the the 2016 Legacy Family Tree webinar series entitled The Private Laws of the Federal and State Governments. As always, you need to register in advance if you want to participate in the webinar live (it’s at 2 p.m. EDT, 1 p.m. CDT, noon MDT and 11 a.m. PDT). And, as always, if you can’t clear your calendar for that block of time, remember that Legacy Family Tree webinars are available, free, for a few days after each webinar, and then available for purchase (individually or as a subscription package) so you can review the information more slowly, in more depth, at your own pace. 75 years old and learn something new everyday. Did not find private law rulings in Texas but did find this and it was interesting. Many states that originally were under civil law (Spanish, French and Dutch colonies) imposed some aspects of civil law in their own jurisdictions, Stan. So community property — that mainstay of Texas divorce law — is a civil law concept.